Media has become an indispensable part of our lives. There are two major sources of media having electronic media and print media. It is media keep us up to date all local, national and international news. 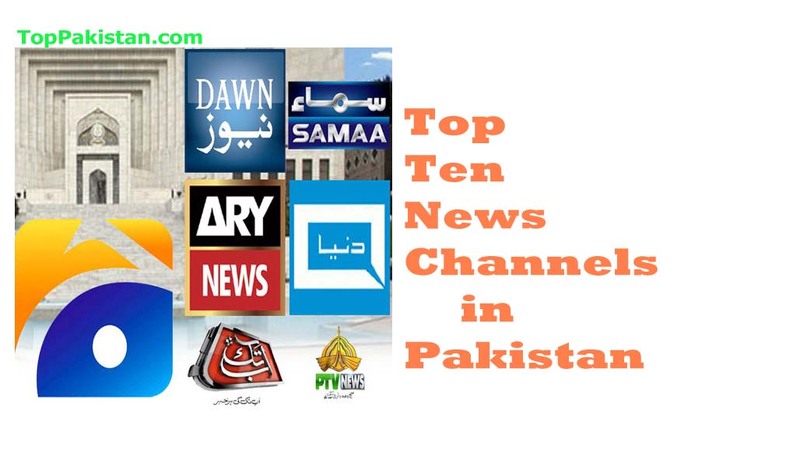 Here is the list of Ten electronic media. PTV news is a government channel that gives News in,Sindhi , as well as Arabic , Pashto, Kashmiri and in others local languages. It’s another name is PTV World. Its famous shows are Dateline Pakistan , Insight with Sidra Iqbal and Good Morning Pakistan. In the past, it was most watchable TV channel of the world. Nevertheless, this channel is not too much advanced and does not offer a lot of entertainment to its viewer but worth full for information. It is the most watchable Pakistani news channel. It is owned by Jang Group. It started work as a proper channel in October 2002. Although, this channel has banned much time due to illegal closure for many months but still this channel is considered one of the popular news channels. It has some other channels including GEO Kahani, GEO Super, and GEO Entertainment and also AAG TVit has millions of fan due to good coverage. Despite the some controversies, it is still at the top most position. It has started it services on January 1, 2008. It offered ‘Express 24/7’ channel on February 5, 2009. They have also launched some entertainment channel on 1 January 2012. It has a high popularity among its fan. This channel has got the name in a very short period of time and makes us aware of all the current affairs and all the issues. It is one of leading and very famous news channel in 2016. It was formed in the year of 2004. It is a piece of the ARY Digital Network. Some ARY channels are ARY Digital that is the normally Entertainment Channel, ARY Qtv, ARY Music and ARY Zindagi too. It is generally believe that this news channel has the highest position in all viewers. Although, this news channel has also been suffered in many of the controversies such as Mubashar Luqman but this channel has still viewership and the huge reporting line. It has been providing services since March 23, 2005 .Business Recorder Group started this channel . This group has the other channel too named by Play Max that is one of the entertainment channel offering services in 60 countries. This channel is also one of the most admired news channels and most demanding news channel. We have seen that its popularity has been increasing day by day. It has around 76 million viewers per week. It has started services on 11 March 1999. It gives us all breaking news, all the lifestyle programmes, interviews, and documentaries. It is the oldest news channels of Pakistan. It is covering news throughout the world. Whenever we wish for some international current affairs news then we watch to this channel. It has been offering services in Pakistan since 1980 and founded by American media proprietor Ted Turner and is one the most approachable and popular channel for news in Pakistan as well as another part of world. Samaa Tv is the most famous and leading news channel in Pakistan that was launched in 2007 and owned by Jaag Broadcasting System (PVT) LTD. Sama T.V has a brilliant reporting rate and has got name and fame all over the Pakistan due to its good services and gives breaking news on a time. The motto of it is that “SANSANI NAHI SIRF KAHBRAIN”. KTN stands for Kawish Television Network news channel. It mostly broadcast news in sindi language. Kawish News Group launched this news channel some years ago. This news channel is the most famous and popular Sindhi language news channel that offers and focus on various types of news and has millions of fans in all over the Pakistan. The slogan of this news channel is “JO SACH HAI WO KHABAR HAI”. Indus news channel is established by Indus Media Group and has become one of the leading news channels that concentrate and focus on each and every news very immediately.